The word Gharana means “family”. In relation to music, Gharana refers to a family of musicians, a school of music or a musical lineage connected with the name of a particular person or place. The characteristic feature of a Gharana is its special style of presentation: the result of the special and extraordinary creativity and innovation of a highly talented musician. The other musicians of the Gharana may have their own individual features of presentation, but their training and conditioning in the distinguishing style of the Gharana is bound to leave indelible and recognisable stamps on the presentation of the performer. In this sense, Gharana are discernible for quite a long time, although some may have been distinct. Again, there are some Gharana that are “hybrid”, i.e., they show mixed styles taken from other Gharana. The emergence of the Gharana system in our music and its growing importance in the 18th and 19th centuries had its own impact upon the evolution of Raga. A Gharana may take the name of (a) the name of a person, family or group or (b) a place or region. Examples of the first category are Seni Gharana, Imdadkhani Gharana, Kavval Gharana and so on. Example of the second category are Gwalior Gharana. Agra Gharana and so on. In this context, it should be noted that there is a saying that to be able to call a school / tradition a Gharana there must have been at least three generations of established teacher – disciple pedagogic relationships already gone before. Thus, for example, a musician cannot merely migrate from India and settle in, say, Fiji and start a school with a band of students (no matter how serious, motivated and dedicated they all be) and then call his school the Fiji Gharana. Unless the teacher has produced students (Generation A) of acceptably high calibre who have proven themselves in the presence of knowledgeable (qualified) listeners, and the Generation A students have produced similarly acceptable and proven students (Generation B) themselves, and further the Generation B students in their turn have produced similar and proven students (Generation C), there cannot be a Fiji Gharana in this example. Each Gharana has its own special Silsila or style or logic of presentation, within the general framework of the regional Bani (or, for instrumental music, Baj) which applied to it. Thus, the rise of the Gharana system resulted in the segmentation of the different styles of Raga development. This sometimes led to different versions of the same Raga, specially when comparisons arose between the presentations of musicians of different Gharana presenting the same Raga. This has had a spin-off to the present day. For example, Gwalior Gharana musicians use Shuddha Ni in addition to Komal Ni in Raga Rageshvari but musicians of several other Gharana use only Komal Ni and not Shuddha Ni. 1. A musician of a particular Gharana may be invited to a court situated far away for performance or even service. In that case, it would be natural that he is influenced by the Raga in vogue in that place, just as the “native” or “local” musicians of that place would be influenced by the new (to them) Raga that the Gharana musician brought with him. 2. Often, certain Raga and / or Bandish or compositions would be considered the “property” of a particular Gharana. That is, the Raga in question would be known only to the musicians of that Gharana and to none else. This would be especially true if the Raga was created in the Gharana. It was the custom to sometimes “gift” some of these Raga / Bandish as dowry to a son-in-law. In this way, Many Raga found their way into Gharana where the Raga had not been in existence before. If the recipient or new “owner” of the Raga was a musician of another Gharana, he would naturally be guided by his own background conditioning in presenting this received Raga; this would quite conceivably cause some variation in it that might remain or even become heightened with the passage of time. 3. Another common custom was for the princes and noblemen, and also for the new breed of rich men on the post-Moghul period (18th and 19th centuries) to hold Sabha or musical soirees where musicians of different Gharana would present their music. This would lead to an interchange of ideas where musicians would be influenced by the presentations of those of other Gharana. Thus the Gharana system served to “dilute” the previous “insularity” of Raga music. The result was that musicians of one Gharana began to present Raga of another Gharana in their own conditioned styles. 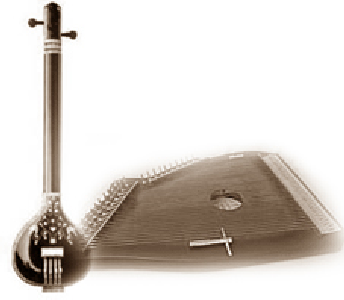 For example, if a musician trained in the Gaurhar Bani style , where there was a good deal of Vilambit or slow tempo development with plenty of long drawn , took up a Raga like, say, Bahar, in which there was no Vilambit, he would by his own background pedagogic conditioning have a strong tendency to present Bahar in his own style, that is, he would incorporate plenty of Vilambit passages into the Raga and perhaps compose his own Vilambit Bandish in the Raga. Thus, the very character of the Raga would change over time. A good example of this phenomenon is the well known Vilambit composition “Nabi ke Durbar” in the Raga Basant, which was not a slow Raga to start with. Another fallout of this dilution was the emergence of new Raga, often in old names. It was now possible for two Raga of divergent sentiments or characteristics to have the same name. Previously, a Raga may have had minor variants in such a way that the basic character or sentiment of the Raga remained intact. For example, Pandit Ahobal reports in his monumental work Sangit Parijata (16th century) that the Raga Bhairavi had two forms, one with R and the other with R. The manner of application of both R and R were, however, the same. Thus the basic nature of Bhairavi – the main sentiment that it conveyed – remained the same in either case, as all the other notes, their Kaku, their Sangati etc. were the same in either form. The “mood” of Bhairavi, therefore, remained constant. Indeed, as long as this was maintained, such minor variations in the presentation of a Raga were acceptable. However, in the Gharana system, two Raga bearing the same name could have completely different features, and hence completely dissimilar moods. Thus for example, in the case of the Raga Shree, it is seen that a type of Shree called Poorvi Shree, similar to the modern Shree, was in vogue. This is reported in Hrdayanarayana’s Hrdayakautuka (17th century). The original Shree, which had G, D and N, became more or less obsolete in north India although in south India, it continued to be (and still is) in existence. By and by, this new Raga Poorvi Shree was abbreviated to Shree and became the Shri of modern times. The original Shri is to be seen in north India in the Raga Bageshri (also called Bageshvari), in altered form. Such metamorphoses were the result of the action of the Gharana system. In like manner, some Gharana used D in Raga like Lalit and Poorvi whereas some other Gharana used D instead. The net result of all this was that the system of Raga became quite confusing, since it lost a good deal of the standardisation of earlier times. Rag Megh by Mohammed Akhtar Khan of Shaam Chauarasi Gharana. The name of Sham Chaurasi Gharana is attributed to a place called Sham Chaurasi in Hoshiapur District of Punjab. Like the artists of Talwandi Gharana, the Sham Chaurasigharana also claim their association with the founder of Talwandi Gharana, Ustad Suraj Khan and Chand Khan alias Sudhakar and Diwakar, who were the disciples of swami Haridas. Though the roots of these two Gharanas were the same, yet they developed into two different streams. Today, Sham Chaurasi gharana has lost its identity for want of the representatives of this gharana. Some artists have become very old and the great exponents of this gharana like Nazakat Ali and Salamat Ali has settled in Pakistan after the partition. But it is a matter of satisfaction that they still calim to be the descendants of sham Chaurasi Gharana. The Sham Chaurasi Gharana was once a very prestigious gharana. It is said that the Mughal king Mohammad Shah Rangile once paid a visit to this village to listen to the artists of this gharana. He was so pleased that he donated all the income acquired from the 84 villages to the Sufi saint Shami Shah. It is believed that after this episode that became popular by the name Sham Chaurasi taking its name from Sufi saint Shami and 84 villages, Chaurasia adding up as Sahm Chaurasi. This village still exists by the same name. The Samadhi of Sifi saint Shami Shah is still there and many people come to pay their homage at this place. Ustad Salamat ali also used to come to Sham Chaurasi to pay obeisance wherever he came to India. According to Pandit Dilip Chandra Vedi, Sain Karim was a great exponent to Sham Chaurasi Gharana. The vocalist as well as the instrumentalists of this gharana earned a lot of fame. One of the eminent Veena players of this Gharana was Baba Inayat Khan. The proficient artists of this Gharana received tutelage under legendry Baiju Bawra, Suraj Khan and Chand Khan. According to history Baiju Bawara had gone to visit the village Bajwada near Hoshiarpur. It is believed that that during his stay the artists of sham Chaurasi Gharana had received training from him. It is also possible had the name of this village was named as Bajwada after the name of Baiju Bawra. Several artists of this Gharana had shifted to Pakistan after the partition of India. Meer Baksh, Khairdeen, Vilayat Ali, Haidat Ali, Nazakat Ali and Salamar Ali all began singing in Jugalbandi. Presently many singers like master Rattan of Phagwda, Om Prakash Mohan have kept up the tradition of the Sham Chaurasi Gharana. They all perform in the All Indian radio, Delhi. Sham Chaurasi Gharana has been famous for its simple Sapat taanas that can be performed with ease. The elaboration is done in all the three octaves. The basic feature of this Gharana is the step by step Alap and Taana that gradually returns to the basic Shadaj. The artists of this gharana are popular for their execution of these taanas. The beautiful taanas, murki, khatka and bol banav added to the magnificence of the gayaki of this gharana. The gharana is believed to have been founded in the 16th century by Mian Chand Khan and Mian Suraj Khan who were contemporaries of Mian Tansen at the court of Mughal emperor Akbar. Successive generations of musicians in the gharana specialised in the dhrupad form of singing and evolved a tradition of duet vocal jugalbandi performances. Mian Karim Bukhsh Majzoob, Ustad Ahmed Ali Khan, Ustad Niaz Hussain Shami, and Ustad Vilayat Ali Khan were some of the illustrious members of the Sham Chaurasi gharana. The township of Sham Chaurasia (sham = evening, chaurasi =84) was named after a cluster of 84 villages which constituted a land revenue unit in the time of Ranjit Singh. According to one legend, the founders were given a parcel of land here as a grant to them by Akbar.